The water’s turning green in honor of St. Patrick’s Day. The USNWC will “Go Green” on Saturday, March 12 as we turn our whitewater river green. With a full day of festivities planned, you won’t want to miss out on seeing the ONLY whitewater river in the world dyed green in honor of Saint Patrick’s Day. 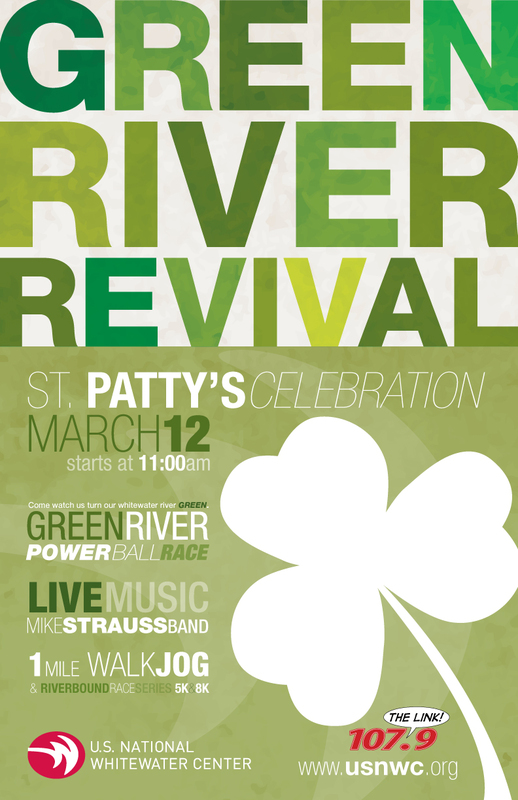 We’ll kick off the Green River Revival celebration at 11 a.m. when we turn the world’s largest man-made whitewater river shamrock green. Additional festivities will include, live music by the Mike Strauss Band, a 1 Mile Walk/Jog and a POWERBALL Race. So… Who’s coming with me? This entry was posted on Wednesday, February 23rd, 2011 at 8:29 pm and is filed under USNWC. You can follow any responses to this entry through the RSS 2.0 feed. You can leave a response, or trackback from your own site.